When you're watching a TV programme primarily so you can catch a glimpse of a bag then you know that you are quite in love with it. So it went when I watched 'Smash' - a show that I couldn't work out why I watched it and could only surmise it was the appeal of Jack Davenport, Anjelica Huston and the bag belonging to Katherine McPhee's character that kept me interested. Ah. The bag. $495 worth of lusciousness. Say what? $495?! That's £315!! How does an out of work dancer afford that? Ridonkulous. And so began my search to find something similar to set my heart soar and my bank balance remain as decent as possible. Expect to see a lot of studded items about in the next few months given how hard the high street is pushing a reworked version of grunge. 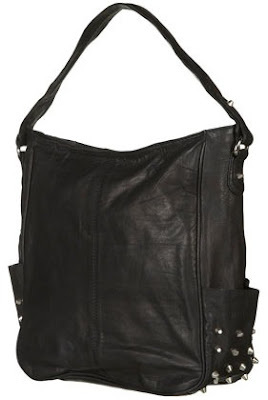 I've searched high and low but I keep coming back to this bag from Topshop. It doesn't have nearly as many studs as the Romy Gold one but that makes it a bit more subtle which sometimes isn't a bad thing. It's roomy enough to shove in loads of stuff that you might need but probably won't use which is a huge plus point for me. And it's also only £68 which is a hell of a lot more affordable. I'll take it!